Awnings date back to Egypt and Syria. Woven mats shaded market stalls and homes. The Roman Empire even had a very early form of a retractable awning at the Colosseum called a velarium. Awnings were visible on American, storefront businesses. Cotton duck was the predominant awning fabric used during the 1800s. \After the Civil War, awnings became especially common. Iron plumbing pipe was a result of industrialization. It was not only affordable but adaptable. Iron plumbing pipe was not hard to thread and easily bendable, allowing for a variety of shapes and sizes. Operable awnings came to be in the second half of the nineteenth century. Initially, you could only roll awnings up by hand rafters. When it came to commercial awnings, extension arms were hinged to join the facade. Rope and pulley mechanisms were then lowered to extend and retract the awning. Retractable awnings were and are still versatile because due to their flexibility and allowance for different amounts of coverage depending on inclement weather. While the 19th century focused on movability, awning fabrics changed in the 20th century. Cotton duck was known for stretching, fading, being susceptible to mildew and flammability in the case of cigarettes and matches. After World War II, vinyl fabric awnings became popular. Vinyl fabrics are durable because of their ability to withstand water damage and fading. The 1960s is when more fabrics appeared such as acrylic, polyester, and mesh. 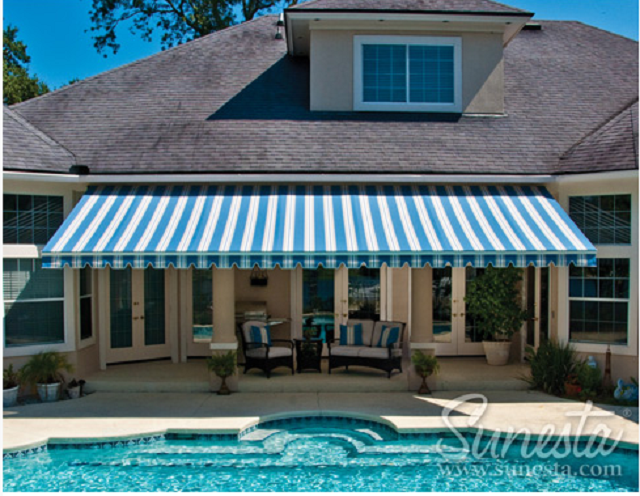 Awnings are no longer just utilized in strip malls or commercial sites with heavy customer flow. Awnings are renovated in historic sites and are popular in homes. Features of newer awnings can include but are not limited to fixed frames made from aluminum or steel with a wide array of fabrics to choose from. Canopies can also be manufactured entirely from aluminum to add a more architectural appeal to any space.